We gather These seeds from various unorganized farmers, cultivators and then we sort them separate them according to industry standards. Then we pack them according to needs of the importers. – It is a combination of sweet, salt and bitter taste. – It is much beneficial to the liver, kidney and large intestine. 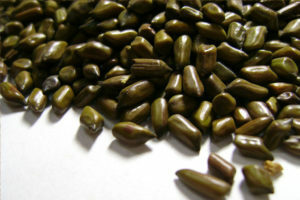 – In Ayurveda Cassia Tora seed are treated as laxatives, expectorants, ophthalmic, etc. – It is found to contain derivate of chrysophanol, fixed oil, anthraquinone, etc. – It is used as an excellent source of cooling down a body. – Helps in loosening bowel and relief from constipation. – It is also used as a natural pesticide in organic farms. – It contains a chrysophanic acid-9-anthrone fungicide. – It can cure skin diseases like psoriasis, itch, and ringworm. – It contains anthraquinones for which it is applied in treating weak dejection in childhood teething, constipation and fever as well. – It is also used to treat blurred vision caused due to yin deficiency in the liver and kidneys by combining with milk. Go to linked page for knowing Uses in detail. An annual fetid herb, with a height of 30 to 90 cm, Cassia Tora is mainly found in the states of Uttar Pradesh and Madhya Pradesh, in India. It has pinnate leaves, which are about 10 cm long. Each leaf has three pairs of leaflets that are opposite, ovate, oblong and oblique at the base. The yellow-colored flowers are bearded in the axel of the leaves. The flowers comprise of five petals, each about a half inch in diameter.